Training Coordinator for Cyprus Mining Co. I became involved in sled dog sports in 1971, when my wife Pam decided she wanted to raise either a baseball team or a sled dog team. I bought her a Siberian Husky that afternoon. We became aquatinted with Nancy Black, a local musher and a very colorful personality, and she convinced me to help her train her Siberian team. My first time ever on a sled was a terrifying ride off a steep mountain with a 16 dog team. Nothing I had ever done before matched the rush of that first ride and I was hooked. I started sprint racing in 1972 and raced Siberians for about 10 years. The Alaskan dogs were first being introduced into the Rocky Mt. Region in the late 70s and Pam and I decided we wanted to raise some of that breed and expand our kennel. I was becoming involved with ISDRA on a local level an in the early 80s ran for regional director. 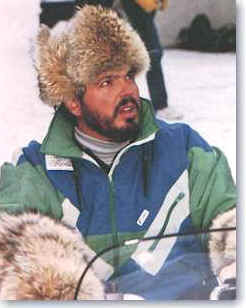 I became very involved in the RMSDC and was in the middle of sled dog politics for about 15 years. During that time I met many of the sports great mushers and learned a great deal about what a wonderful athlete the sled dog truly was. I am a past President of ISDRA , President of USSDSF, long time officer and board member of the RMSDC as well as a 25 year board member of the Middle Park Mushers of Grand County Colorado. I have officiated events in the lower 48, Canada and Europe. Currently Pam and I have a 18 dog kennel of Alaskans and enjoy sprint racing 8 or 9 events in the Western US and Canada. I have seen the sport develop, as well as the dogs, for almost 30 years and am still as excited about it today as I was when I took my first breathtaking ride on a sled. There have been so many to learn from I can hardly point to one individual. I use 55 gal. Plastic barrels bedded with straw for kennels. Clean, warm, dry, safe space. I use a primary dry kibble and supplement with Energy Pac in the summer and add meat in the fall and through out racing season. Males and Females on opposite sides of the kennel. Kennel enclosed in a large compound fence. Keep a good routine of feeding, cleaning and playing every day. Well balanced structurally, light quick step, good angle on front end, naturally muscled. Happy, strong headed, yet sensitive to any mood of mine. North, from Doug McRae of Wisconsin has to be one of my favorites. He will be 20 this spring and raced every race we entered until he was 18. I bought him as a 7 year old leader off of an open team and he has helped train every leader I have for many years. He always wanted to start and always finished faster than he went out. Very egotistical wet kind and gentle male. Play with them with harness and use older dogs to help them start. Typically my pups start naturally and I need to focus their enthusiasm in the right direction. Attitude and build. If he or she isnt built for speed they're never going to make the top team. Start with slow muscle toning and short mileage and work up to the distance they will race after 100 miles or so of short work. I usually go 10 hook ups at each distance working up. Never let the dogs run wide open on dirt and only after they are in top shape on snow. Never ask a dog to do something that they are not physically capable of or have not been trained to do. Yes we set milestone in training based on the first race and when we want them to peak. A good foundation through a lot of hook ups and, of course, miles. Every run has to have a pre-established purpose. It is in training where the dogs learn how to race not on the race coarse. Brains, mine as well as the dogs. Think ahead - always - to keep from having a bad training experience for the dogs. One disastrous run can damage an entire season. They must be sanctioned and I need to know they have good safe trails. I dont take myself too seriously and I always let the dogs determine the pace going out, I only ask them to run my speed when I call them up to go home. I never cheat the dogs. My size is a disadvantage--I weigh over 200 pounds. Every year it changes with the kennel. As an overall career I have met my goal: I have met some of the best people in the world and seen and owned some of the best dogs. The sport will never be huge--it has its place in the scheme of things. But the sport needs to concentrate on being the best it can be given its limitations. That is where the sport lives. The organizations need to work together to promote the sport and share the responsibility of caring for the sponsors. Find a good, well cared for kennel and learn as much as they can. Dont be afraid to ask and listen when they dont know. One was a ride on the railroad tracks with an 8 dog team in front of a passenger train. And that story would take about 2 pages and a 6 pack of beer. And my trips to the World Championships with the IFSS as an official.